“For about 10,000 years people and cows have had a mutually beneficial relationship. We gave cows pastures and protected them from predators. They pulled our barges, plows and wagons. About 50 years ago in the United States that fell apart,” says Denis Hayes, president of the Bullitt Foundation and co-author of "Cowed: The Hidden Impact of 93 Million Cows on America’s Health, Economy, Politics, Culture, and Environment." Hayes has spoken out on this topic at sustainability conferences such as Verge and with eco news sources like Grist. His goal is not to convince people to stop eating beef. Instead, he tries to convince readers to reduce their meat consumption. Reducing the amount of burgers you eat is a great first step. If Americans reduced meat consumption, the benefits would be epic. But since all of us are already environmentally conscientious, let's go one step further and talk about the 10 reasons we should make not eating meat our New Year’s resolution. 1. The water it takes to produce 10 burgers is the same amount of water you use to shower for a year. In fact, agriculture is responsible for 80 to 90 percent of water consumption in the U.S. “One pound of beef equals 2,500 gallons of water. But cows are not the only water hogs. Sorry, bacon lovers: One pound of pork requires 800 gallons of water. 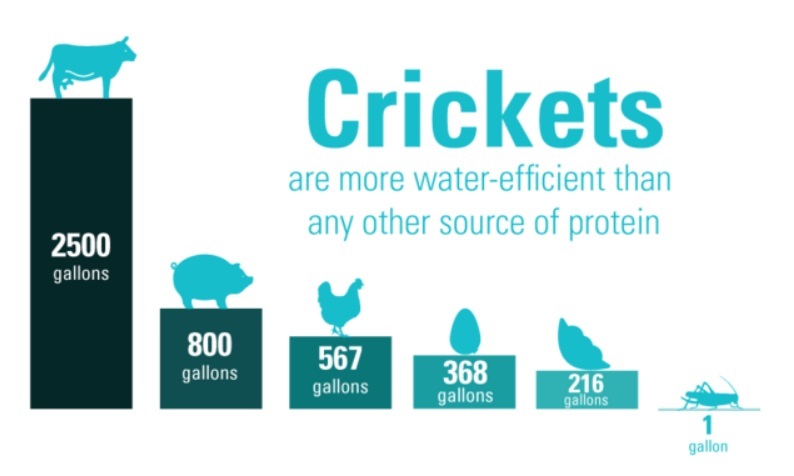 Apologies, benedict fans: A dozen eggs need 636 gallons of water,” says Leslie Ziegler, cofounder of Bitty Foods, a startup that sells tasty baked goods made with cricket flour. Almost all of the facts below were compiled by the documentary "Cowspiracy," and the original sources are listed on its website. 2. Animal agriculture causes 18 percent of greenhouse gas emissions. That’s more than cars, trucks, trains, airplanes and all other vehicle transportation put together. We regularly talk about taking public transportation, car pooling, cycling and buying carbon offsets when we travel. All of that is important, but reducing our meat consumption would have an even larger environmental benefit. 3. Three-fourths of the world’s fisheries are exploited or depleted. Sure we know that troll- or pole-caught fish is more sustainable. But should we even be eating fish? Given the current rate of fishing, we could have fishless oceans by 2048. Some estimate that as many as 2.7 trillion animals are harvested from the ocean each year. It’s time to give the oceans a break and let them recover from their traumatic loses. 4. Animal agriculture is responsible for up to 91 percent of Amazon destruction. Estimates vary, but up to 137 plant, animal and insect species are lost each day because the rainforest is being torn down. 5. Get this, 1.5 acres can produce 37,000 pounds of plant-based food. In contrast, 1.5 acres can only produce 375 pounds of meat. Many people don't have enough food to eat today, and the world's population is quickly growing. One way to help ensure that there's enough food for everyone is to reduce our consumption of animal products because it's unsustainable. However, we can feed everyone if we eat plant-based food instead. 6. Every day you eat vegan meals, you save 1,100 gallons of water, 45 pounds of grain, 30 square feet of forested land, 20 pounds of CO2 equivalent emissions and one animal’s life. Wow. When I learned this, it made me realize that taking shorter showers, turning off lights and taking public transportation were only a small fraction of what I could do. By becoming mostly vegan, I had more power to do good than I had realized! 7. Animal agriculture is the No. 1 reason for species extinction, ocean dead zones, water pollution and habitat destruction. When we eat packaged food from the grocery store, we become very detached from the source of our food. We don't know how it's grown and processed or the larger impact it has on the environment. It's good to try to take a step back and look at our eating habits from a third party's perspective and look at the big picture to see how we're impacting the world. 8. Livestock operations have created more than 500 nitrogen-flooded deadzones around the world in our oceans. I had never heard of a nitrogen dead zone before, so I needed an explanation. Here's what's up. Dead zones occur when nitrogen and phosphorus from agricultural fertilizer and sewage enters the ocean. Ewww. It creates a zone of oxygen-depleted water. This kills the plants and fish in the area. For example, the northern part of the Gulf of Mexico has a 6,000-square-mile dead zone full of dead everything. 9. Not eating meat works wonders for your health. No surprise here. The Harvard School of Public Health discovered that “eating even small amounts of red meat, especially processed red meat, on a regular basis is linked to an increased risk of heart disease and stroke, and the risk of dying from cardiovascular disease or any other cause.” Additionally, a report by the World Health Organization released earlier this year found that processed meat likely leads to cancer. 10. Consistency. If we say we care about the environment, then to be consistent with our beliefs we should take big steps to reduce our environmental impact. For most, if not all of us, not eating meat is the easiest way to have a significant positive impact on the environment. Imagine what the world would be like if everyone mostly ate plant-based foods? No meat, no ‘mo problems. Or something good like that. Bring on the fruits and veggies!